Peggy Lee was one of great female singers of the post-war era, her unmistakeable sophisticated and sultry style making her one of the most distinctive performers of the time, ranging across the genres from ballads to jazz and pure pop. She began her recording career when she joined Benny Goodman’s Orchestra as vocalist in 1941, when she had just turned 21, and was with Goodman for two years until 1943, when she married guitarist Dave Barbour and they both left the band. She recorded some some sessions again with Goodman in 1947. 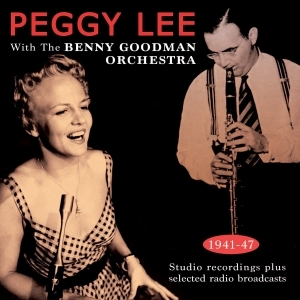 This 44-track 2-CD set comprises titles which she recorded with Goodman’s orchestra in the initial period, and were released at the time on Columbia, along with alternate takes of the songs and titles which were not released at the time, plus titles from the 1947 sessions. Also included are some hard-to-find radio recordings from the 1941-43 period, which capture Peggy working in a ‘live’ environment. It’s an entertaining anthology of her work during what was a key formative time in the career of a great artist, and a great showcase for a talent which was already abundantly evident.